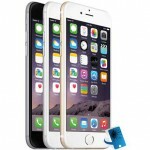 iPhone 6 screen repair Surrey includes delivery to all towns within 10-15 miles of Guildford. We have been installing 100% Genuine Apple iPhone Screens to businesses and residents in Surrey for over 3 years. Our service is very different to a walk-in shop service in that we go directly to you at your home, work or even at a shopping centre so you can work, relax at home or shop while we repair your iPhone 6 in our mobile phone repair unit. All screens are covered by our 120 day warranty. To find out more about our iPhone 6 Screen repair warranty then please view our Warranty page. iPhone 6 Screen repair and iPhone 6+ screen repair typically takes between 10-15 minutes of arrival. No more waiting around to get an appointment at the Apple store in Kingston. We supply the Genuine Apple iPhone 6 LCD screens directly to your door! We have historically only installed Original Apple LCD screens but due to many of our competitors only installing non-original copy screens and undercutting our prices we have decided to offer the cheaper screens as an alternative for those on a budget. AAA High Copy screen warranty is for 60 days but Original Apple LCD screens are complete with 120 day warranty. iPhone 6 Screen Repair with a Genuine Original Apple LCD screen – £85 when booked here. iPhone 6 Screen Repair with an AAA Grade High Copy LCD screen – £70 when booked here. iPhone 6 Plus Screen Repair with an AAA Grade High Copy LCD screen – £85 when booked here. iPhone 6S Screen Repair with a Genuine Original Apple LCD screen – £110 when booked here. iPhone 6S Screen Repair with an AAA Grade High Copy LCD screen – £85 when booked here. iPhone 6S Plus Screen Repair – with an AAA Grade High Copy LCD screen – £115 when booked here. Book your iPhone 6 Screen Repair in Surrey on-line today.